A natural tooth is anchored in the bone through its roots. Without roots, we have to find solutions to solidly anchor a prosthesis.Ours Dentists at Lille (59000) and at Neufchatel-Hardelot (62152 ) will help advise you n the solution the most adaptedto your health. There are 3 methods to deal with absent roots. Artificial teeth are fastened on a metal bar which is resting on the gums and remaining teeth. • It is bigger and less comfortable than a fixed prosthesis, whether a bridge or an implant. • It puts pressure on remaining teeth. • There is a risk to damage the gums. Unavoidable when other solutions are not possible. 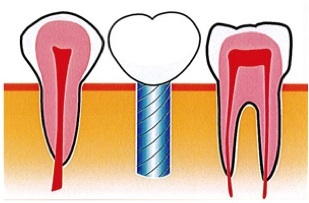 We use the teeth available on each side of the missing tooth to create a 3 crowns unit. The middle crown is the bridge relying on the side crowns which act as supporting pillars. This technique can also be used for several adjacent missing teeth. The most usual solution, very reliable, and aesthetically pleasing. To replace a missing tooth, we have to prepare the adjacent teeth by triming them, et quite often by doing a root canal job on them, which weakens them. We replace the lost natural root with an artificial root, fastened in the bone, assuming the bone is strong and bulky enough to receive the implant. The crown will then be using this artificial root. An implant is the best solution to protect the adjacent teeth, while maintaining the bone and preventing other teeth from loosing their own support. This solution can only be used when adjacent teeth have not moved. The bone which will receive the implant must be bulky enough and of good quality.